After reading so many blogs, interesting articles about dhanushkodi and ram sethu, I was really excited to visit this beautiful haunted place. Dhanushkodi is located at a distance of around 23 km from Rameshwaram, on the southern tip of India. This is the place where Bay of bengal meets Indian Ocean. 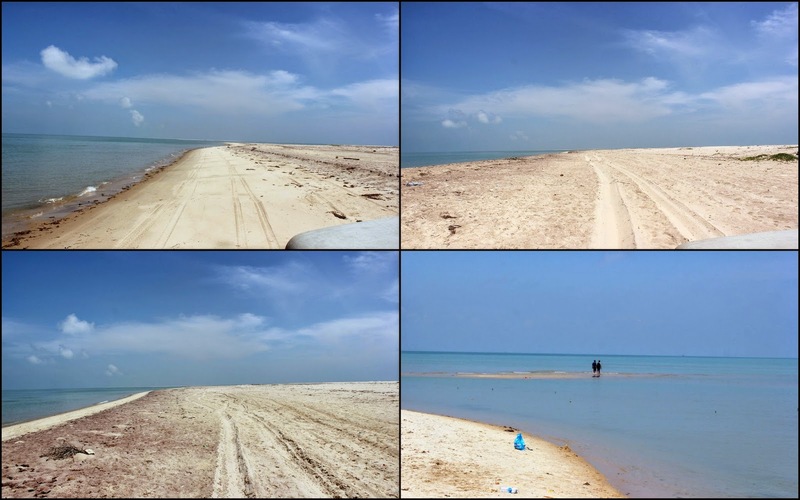 Trip to Dhanushkodi will be a life time experience, the landscapes, off road driving, beaches, everything make this place as one of the must visit destinations in India. The Hindu scripture Ramayana says that Lord Rama built a bridge or causeway, called Ram Setu or Rama's bridge, between the mainland and Sri Lanka, in order to bring his army across. After Rama won the war and crowned a new king of Lanka, Vibhishana, Vibihishana requested Rama to destroy the bridge. Rama broke the bridge with one end of his bow. Hence, the name Dhanushkodi or "end of the bow" (dhanush meaning bow and kodi meaning end). It is also said that Rama originally marked the spot for the bridge with one end of his famous bow. Since Srilanka is just 31 km away, there were many ferry services between Dhanushkodi and Talaimannar of Ceylon, transporting travelers and goods across the sea. There were hotels, textile shops and dharmashalas catering to these pilgrims and travelers. Dhanushkodi in those days had a railway station, a small railway hospital, primary schools, a post office, customs and port offices etc. On that night (22 December 1962) at 23.55 hours while entering Dhanushkodi railway station, the train No.653, Pamban-Dhanushkodi Passenger, a daily regular service which left Pamban with 110 passengers and 5 railway staff, was only few hundred yards before Dhanushkodi Railway station when it was hit by a massive tidal wave. The whole train was washed away killing all 115 on board. A few meters ahead of Dhanushkodi, the signal failed. With pitch darkness around and no indication of the signal being restored, the driver blew a long whistle and decided to take the risk. Minutes later, a huge tidal wave submerged all the six coaches in deep water. All together over 1800 people died in the cyclonic storm. All dwelling houses and other structures in Dhanushkodi town were marooned in the storm . The high tidal waves moved deep onto this island and ruined the entire town. How to reach Dhanushkodi(23km from Rameshwaram)?? Public Transport: There are frequent buses from Rameshwaram temple till naval check post(14km). Own Transport: All the vehicles are stopped at the naval check post. Only 4wd vehicles are allowed beyond check post. 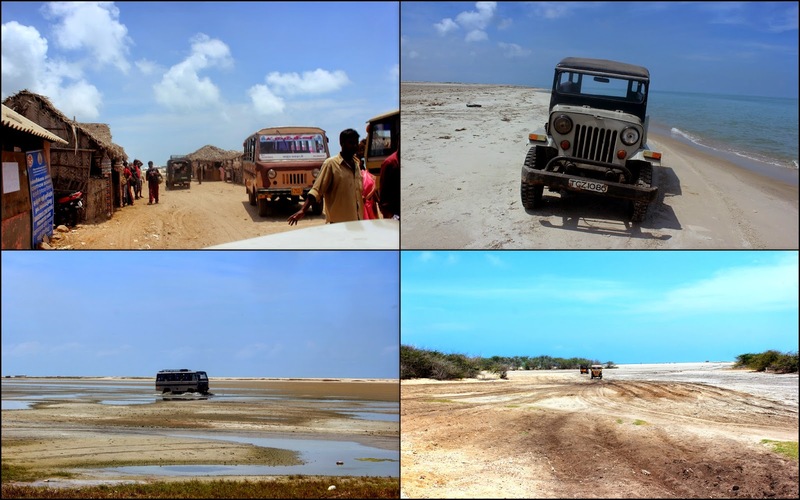 From naval check post, you can hire a jeep or tempo to reach dhanushkodi village. 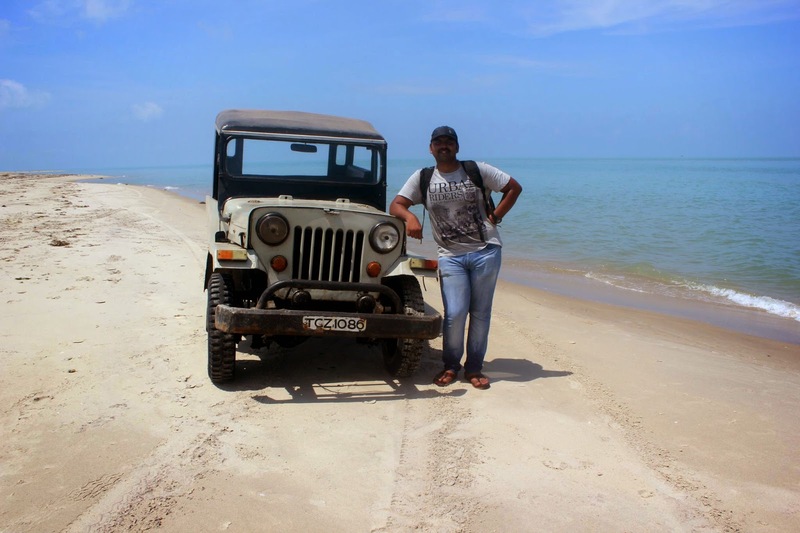 You can hire jeep from rameshwaram too and they will charging 1200-1500 for the round trip. If you don't want to spend this amount, then you can opt for sharing(200-300 per person), but have to wait till the vehicle gets full. 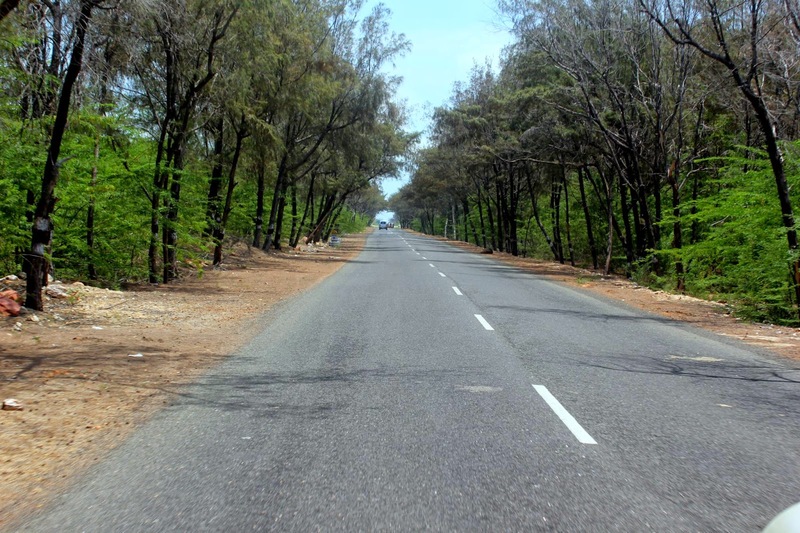 Route from rameshwaram till check post is very good, but be prepared for a bumpy ride after the check post. It is always recommended to visit dhanushkodi in the mornings, as the check-post will be closed post sunset. I highly recommend to opt for a Jeep (not sharing), as these guys will take us till the tip of the island, but for extra cost. I reached rameshwaram at around 10 AM and immediately asked the hotel manager to arrange a jeep for dhanushkodi. The jeep was ready by 12 PM and hotel manager told me to pay 1200 to the driver for the round trip (1200 was a very good deal). It was a very old mahindra jeep fitted with 4wd. The road till the naval check post is very good, both sides covered with trees and no traffic. We reached naval check post by 12.30 PM, which is the entry point for reaching dhanushkodi. There are some fisher man huts, shops, parking area, bus stop and watch tower near the check post. Check post is the last place, If you want to buy any food/water. Time for 4wd!!! There is no road after the check post, the total route was completely covered with sand. The land scapes of the sand and beaches were awesome. It took almost 20 minutes to reach the dhanushkodi village. During this journey, I had a conversation with driver, where he told me many interesting things about dhanushkodi. We stopped at the entrance of the village near the railway station. 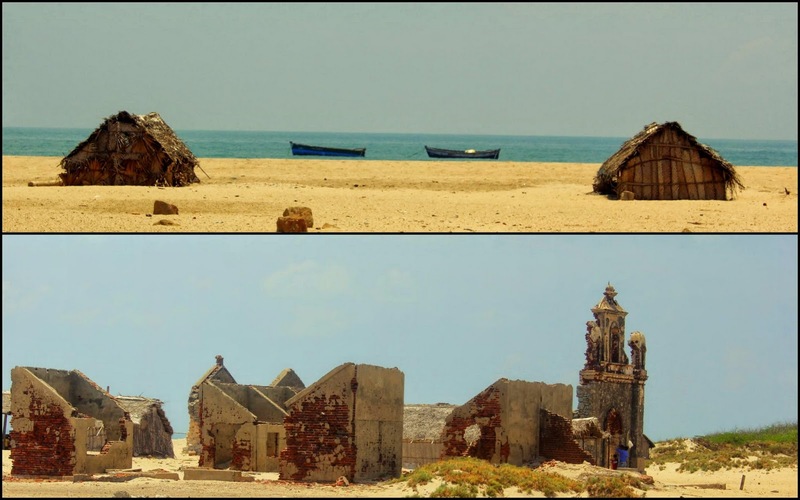 Once you enter the village, after watching the destroyed house, temples and churches, you can still feel the impact of 1964 cyclone on dhanushkodi. I went till last point of the village and it was completely a different feeling. 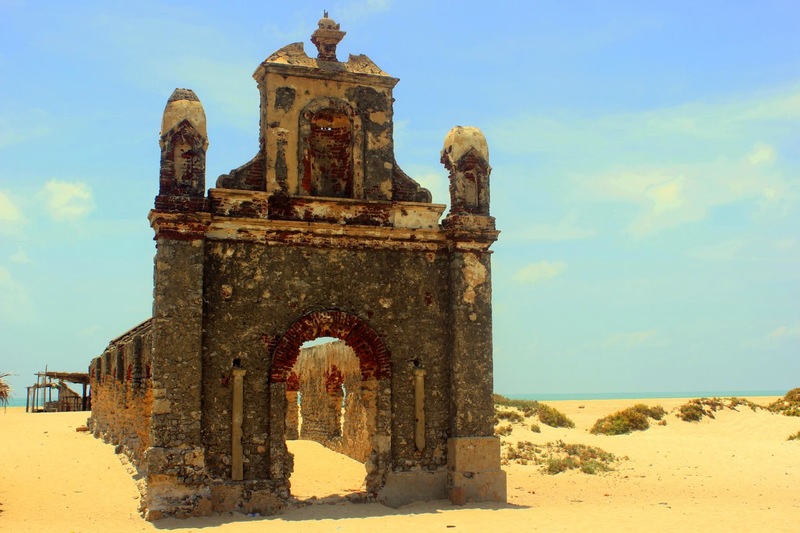 Church which is located in the starting of the village is the main attraction in Dhanushkodi village. I really liked the architecture of the church in dhanushkodi. 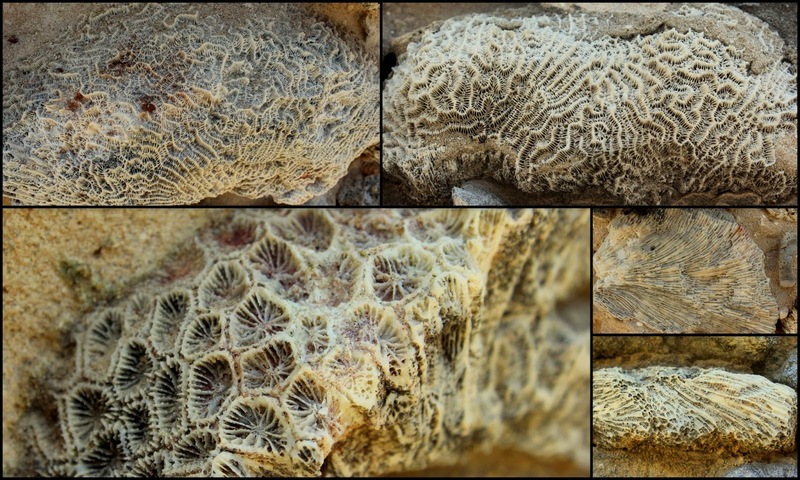 The church was completely build with coral stones, which they took from sea. This church is one of the two churches in the world build with corals stones, the other is in Philippines. Even though the town was completely destroyed due to cyclone, the walls of the church still very strong and according to the locals, this church is build in a such a way that it can with stand earth quakes of magnitude 7. 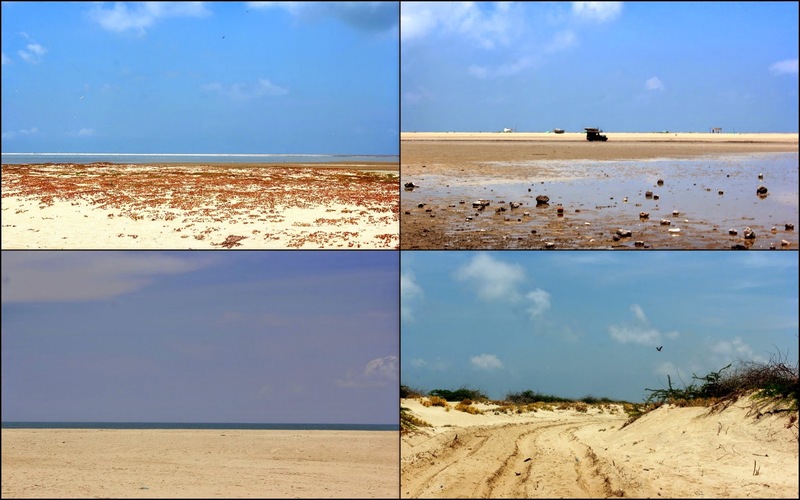 Dhanushkodi village is situated on the western side of the island on the shores Indian Ocean. After visiting the village, we moved towards the eastern part of the island. Compared to the western coast, eastern beach is very good and picturesque. All the vehicles stopped at the starting of the beach and our driver told us that we can't go further till the sangam. As per the driver, the drive till sangam is very difficult because of the large volumes of sand and there wont be anyone to help you in case if we struck in the middle. But I was strongly determined to visit sangam at any cost. I told him that I can pay him extra if he takes me to sangam. Still he was not ready. So I started walking towards the sangam and asked him to accompany. Since it was summer afternoon, it became very difficult to walk for him to walk. Finally he told me that he will bring the jeep. The drive from starting of the beach till sangam was very beautiful. If you are not visiting sangam on your trip to dhanushkodi, then there is no purpose in going to dhanushkodi. We went till tip of the island where Indian Ocean and Bay of Bengal meets. This place is also called as Arichumunai or erosion point, where the ram setu starts. Ocean becomes very calm and less deep, once you reach the tip. 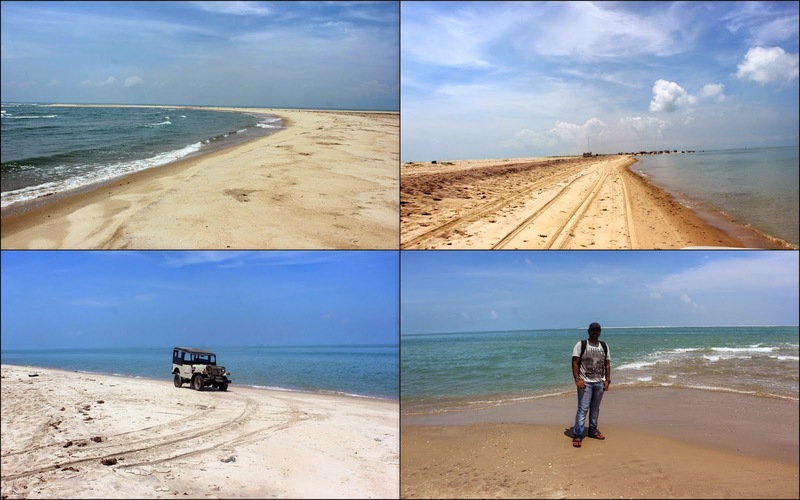 Over all, the ride till sangam was the best part of my trip to dhanushkodi. Many people suggested me to go to dhanushkodi early in the morning, but I felt that afternoon is the best time to take beautiful pictures. After enjoying for almost 2 hours in Dhanushkodi, we started our return journey to rameshwaram. On the way we visited Kodandaramar temple and reached rameshwaram by 3PM. Thats all about my trip to beautiful haunted dhanushkodi!!!! Dhanushkodi looks beautiful. Nice post! Will be visiting Danushkodi in March-2015.Your blog is excellent. Looking forward to visit this place. What is earliest time of the day we can start for Dhanushkodi and can we stop anywhere on the way in Dhanushkodi to take photographs ? Yes you can stop on the way to take pictures. Not a problem. Many people told me that the best time to enjoy dhanushkodi will be during early mornings. Please check with local jeep operators if there any chance of visiting dhanushkodi during sun rise. Hi Ashraf Ashru. I am planning solo trip to go there in Feb'16. Did u visited on dec 12? I am searching for people who visited to Dhanushkodi recently.. Can u plz provide info about hotels, vehicles to reach there from Rameshwaram? It would be helpful to me.Thanks in Advance. Hi bro. This place is awesome! planning to visit in Feb'16. Thanks for your very helpful blog. Planing to visit this summer. A clear detailing of so called ghost town and the hustory behind it. Here is my experiece at this tip..